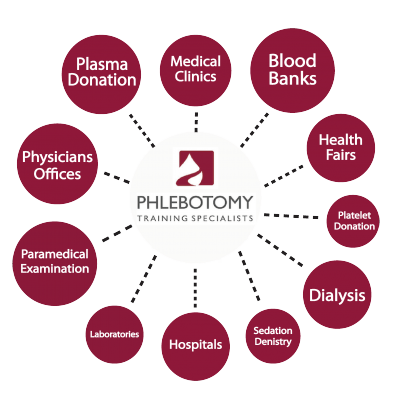 Our Phlebotomy Training & Certification program will prepare you with everything you need to know to work in the field of Phlebotomy! High national exam pass rate – over 92%! Aggressive hands on training to ensure you are competent upon graduation. There is no way I could have experienced the amount of blood draws I did in any other setting. I was an aggressive student and by the time I was done, I had done over 125 blood draws between class and my internship time. Brian and Jason are the absolute best when it comes to knowledge, and the things they do with needles in their own arms are incredible. Take this course, you won’t be disappointed, I guarantee it. Before taking the class and doing the externship in California, I had never even held a needle and had no idea how to draw blood. After going through the class with Lucy, I felt very comfortable with doing blood draws. I am amazed at how much she was able to teach in such a short period of time, and the hands on learning at this school is INCREDIBLE! Overall it has been an amazing experience, and I would definitely recommend this program to anyone who wants to be a Phlebotomist! You can order Cytotec online if you are shying to do it in a local pharmacy.